Christen A. Smith is Assistant Professor of African and African Diaspora Studies and Anthropology at The University of Texas at Austin. 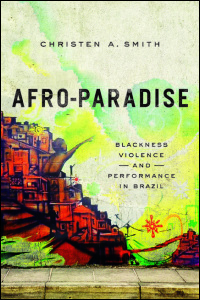 Below she answers questions about her book Afro-Paradise: Blackness, Violence, and Performance in Brazil. Q: You first traveled to Salvador in 2001. Did you have preconceptions of this “Afro-Paradise” that were complicated by what you found when you spent time in Brazil? Christen Smith: I think everyone comes to Brazil with preconceived notions of Brazil’s racial paradise. It is part of the hegemonic global image of Brazil. I grew up hearing U.S. African-Americans refer to Brazil as a place “where race doesn’t matter”—a place without racial segregation, prejudice, and restrictions on social mobility. But that image soon dissipated after I took a class on race in Latin America in college. I was in my senior year and it was a class given by a visiting professor. We spent one week talking about the Black movement in Brazil and that immediately piqued my interests and changed my perspectives. Prior to that I did not know that Brazil had such a sizable Black population, and I did not know that it also had a robust Black movement. By the time I traveled to Brazil for the first time in 2001, I had that bit of background knowledge, but I had no idea the extent to which Black Brazilians were hyper-policed and yet marginalized and ignored in the nation. My first visit to Brazil was during the police strike of 2001. Shortly after I arrived, the Civil and Military police forces went on strike and the city descended into chaos. President Fernando Henrique Cardoso declared martial law and sent in the National Guard—a striking introduction into Brazilian militarism for someone’s first visit to the country. I was living in a middle-class, semi-elite part of the Rio Vermelho neighborhood in Salvador with a white-mestizo host family. At the time I remember watching the National Guard roll down our street in tanks with guns cocked. Their presence meant we could leave our houses and do things like go to the beach and go to the shopping mall. But it wasn’t until after the police strike ended and the National Guard left that I realized how classed and raced my experience as a foreigner during the police strike had been. Because I was living in a zone of White elitism in the city, I had been “protected” by the National Guard. But, the president did not send troops to “protect” the poor, mostly Black outskirts. The National Guard was there to protect “us” (foreigners, White residents, the elite) from “them” (natives, Black residents, the poor). It was that experience that shaped my early conceptions of afro-paradise and provoked me to think seriously about the politics of race and policing in Brazil. Q: Why do the tourist communities in Bahia like Salvador not have the same reputation for crime and violence as Rio de Janeiro? Smith: Bahia is known as Brazil’s “Black Mecca.” It is the heart of Black culture in Brazil—the birthplace of capoeira (African-Brazilian martial art) and candomblé (African-Brazilian religious practice). People inside and outside of Brazil associate Bahia with a utopic, static image of Black joviality. We see this in popular portrayals of Bahia in Brazilian popular media since at least the 20th century. The image that Brazilians and foreigners have of Bahia is mythical and surreal, punctuated by elements of longing and desire. One of the best examples of this is the popular representation of Bahian carnival. Interestingly, Brazilians flock to Bahian carnival more than they flock to Rio de Janeiro—the city we often association with Brazilian carnival. This is primarily because they see Bahia as an escape zone into an alternative reality—one where they can party hard, enjoy the beach and experience an exotic culture—similar to how people from the U.S. imagine the Caribbean. The result is that Bahia gets over-determined as a place to dabble in blackness and have fun, and the everyday realities of living in Bahia, like the painful realities of violence, get erased. Q: Many people, when they think of culture and performance in Brazil, think of Carnival. How can Carnival be a staple and celebration of Brazil but also be something that thrives under state power? Smith: That’s an excellent question, and it’s one that does not have a simple answer. In other words, for the state, creating a space of touristic enjoyment requires removing that which the state marks as dangerous and harmful. This includes, interestingly, Black working-class residents that the state reads as threatening. The police engage in fine-tooth-comb operations in working-class neighborhoods around the city that include nighttime raids, harassment, and oftentimes beatings and killings. An excellent example of this dialectical relationship between police “clean-up” efforts and carnival is the Cabula Massacre of 2015. On February 6, 2015 Bahian special operations police (RONDESP) invaded the community of Vila Moises in the neighborhood of Cabula and summarily killed twelve young Black men. The police initially said that the men were killed in a shoot out when the police confronted them about hoarding weapons and planning to rob a bank. But subsequent forensic evidenced proved that the men were rounded up, brought to a remote location, tortured and executed. All of this happened the week before carnival. We see similar things playing out on the national stage now with the Olympics in Rio. When Brazil got the bid for the Olympics in 2009, it began a project of intensifying policing in favelas around Rio, and in the working class black neighborhoods of the satellite cities where the soccer matches would happen, like Salvador. This included, most notably, the expansion of the UPP (Pacifying Police Units), which now occupy 38 favelas in Rio and some communities in Salvador as well. The UPP has been charged with instituting “armed peace” – a strange oxymoron that reflects the very tension of afro-paradise I discuss in the book. The UPP has been responsible for widespread violence and torture in the spaces it has occupied. Thus the Olympics, like Carnival, has been one of those moments where the enjoyment of Brazil as a tourist space has been paved by the violent repression of poor black people. Q: You write about a social protest theater troupe in Afro-Paradise. Why is performance such an effective way for Brazilians to express the contradictions of the celebration of black culture and exploitation of black bodies? Smith: Because of Brazil’s myth of racial democracy, Brazilian racism often happens em baixo do pano—under the table, so to speak. The pervasiveness of subtle, “friendly” racism (racism between friends, let’s call it), and the cultural aversion to talking openly about questions of race in Brazil often make racism difficult to talk about and, more importantly, reveal. Moreover, oftentimes racial rhetoric in Brazil is progressive and inclusive while racial practice—the way that people embody race and act on it—is quite divisive and harmful. Performance spaces, specifically the theater, are important tools for bringing racism to light in a context where people often refuse to talk about it or act like it does not exist. Even those who routinely experience racism, like Black Brazilians, sometimes experience difficulty articulating their experiences with racism. Performance provides a way to show how racism works when words fail. Q: Is there a connection to be drawn between the black violence in Brazil and violence in African American communities? Smith: Absolutely. We would be remiss to think that the violence that Black Brazilians experiences is a phenomenon isolated from the violence the Black community experiences here in the U.S.
Police violence is an excellent example of this. Many of the policing strategies that law enforcement officials use in Bahia are techniques that were either invented or perfected in the United States, like community policing and stop and frisk. Zero tolerance policies are another example. So many of the same logics that inform racialized policing in the U.S. also inform racialized policing in Brazil, and are part of a global economy of racialized policing that even ties in the legacy of the School of the Americas and the parallels between death squads in Latin America and the Middle East.